An exclusive “Rainbow Drops” print is used on these wellington boots. The boots have a generous width at the calf with adjuster. 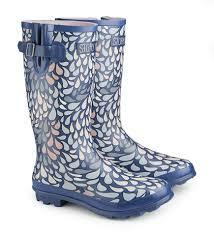 Whether you need them for a farm or a festival, these gorgeous printed wellies will make you stand out. The tread pattern will give you enhanced grip and simply wipe clean with a damp cloth.